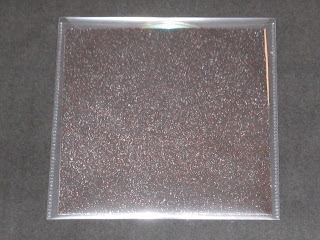 Format: Limited edition CDr released in May 2010 by Frozen Tendril Records (UK), cat ref FTR-03. 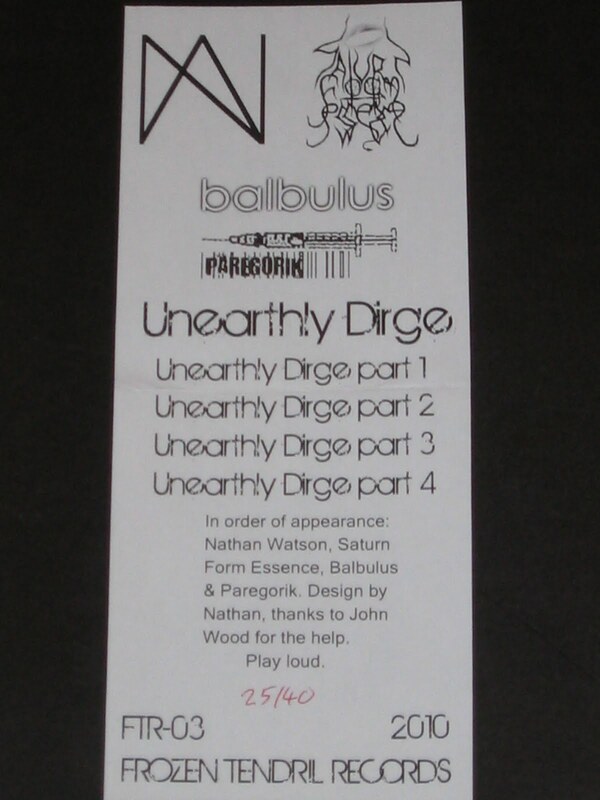 This is a split release between Nathan Watson, SFE, Balbulus and Paregorik. 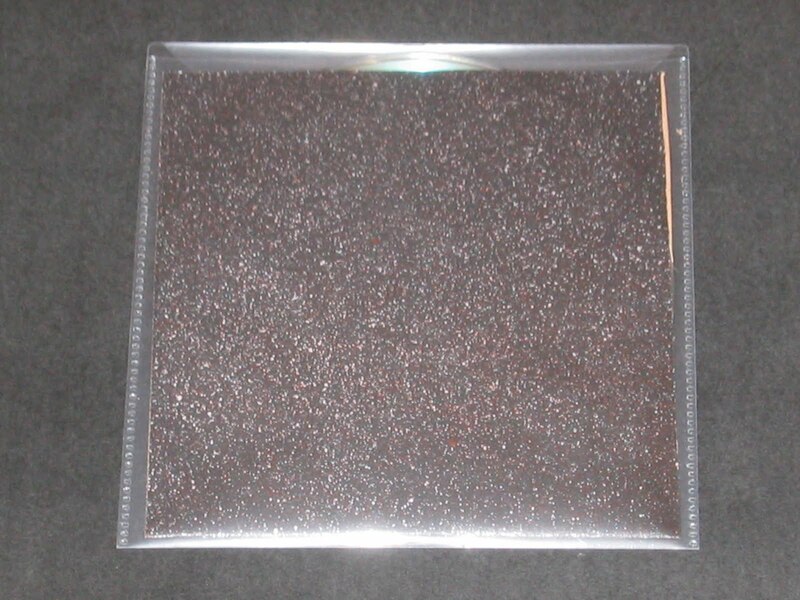 The disc comes in a clear plastic wallet containing a black card sleeve speckled with red and silver spray, and a hand-numbered white insert. This 4-way split CDr release saw the light of day in May 2010 courtesy of UK based Frozen Tendril Records, and features 4 bands from the downtempo/drone music genre in its digitised grooves. Nathan Watson (from Coventry, UK) has a self-professed blend featuring ambient / down-tempo / shoegaze style, and as the man himself has said, "I lack concentration, so switch between mixes of ambient, post rock, drone and sometimes I even get a bit experimental". Balbulus (Kent, UK) feature with their industrial / metal / progressive style, alongside Paregorik (from Pardubice in the Czech Republic) which describes itself as an artsy noise project. And lastly, but by no means least, we see Saturn Form Essence at position number two in the running order. 'Unearthly Dirge' part 2 is a 15 minute-plus slice of interstellar travel. The sensation created by this minimalist track is that of a massive body moving infinitesimally through time and space, ponderous yet inexorable. Forget catchy melodies or an 'everything but the kitchen sink' approach, this is a bare-bones piece of ambient drone that permeates your listening environment with its sullen tones and repetitive sequences. It is far truer to the concept of a dirge-like performance than the other 3 tracks, although perhaps by comparison to the others lacking in overall variety. The cover design is suitably cosmic in theme and execution too, and suits the nature of Saturn Form Essence music down to the ground (or, more accurately perhaps, up in the stars). How did the concept of the 4-way split came about: how did you know the bands, particularly SFE? The idea came about from a drone track I'd been writing. I'd been working on an idea, and thought it'd be a nice idea to release it as part of an album featuring various different types of drone. 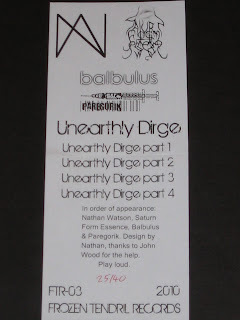 I've known Martin (Paregorik) and John (Balbulus) for a while, mainly through trading releases from my projects and label, and had been observing SFE for a while. I'd enjoyed what I heard and was impressed with SFE's prolific output, which is why I approached SFE as the fourth artist. Are the songs linked in any way other than title, is there a concept here, what were the bands asked to provide? I just mentioned to the bands that I was looking for any type of drone, roughly 10-20 minutes. I don't think I set any more constraints than that, apart from I suggested the use of white noise at the start of tracks, but I would not like someone to make music to my specifications just because I wanted it, the artist should have total control of their music, so these were merely suggestions. Your thoughts (if any) about the SFE project?